Welcome to Cardi Banners, a friendly professional printing company based in Cardigan, West Wales. At Cardi Banners we design banners and business logos to meet your needs or your design. 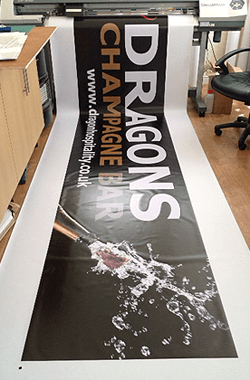 If you require shop signs, banners or stickers in Cardigan, Newcastle Emlyn, Carmarthen, Carmarthenshire, Ceredigion, Pembrokshire or anywhere across the UK please call or email us and we'll be happy to take on your ideas and requirements. We also enlarge and print photos, transform your digital photo into a unique canvas to keep those cherished moments forever being printed on a high quality canvas which is water resistant. Cardi Banners use the BEST grade canvas on the worlds best wide format printer. No matter how big or small, bespoke or simple your project requirements are, we are here to cater for your needs professionally and affordably. So whether you need a window graphic stating your opening hours or advertising on a small fleet of vans, we can do it! Leave a lasting impression with unique business cards from Cardi Banners. Just add your details. Get business booming by ordering some new cards today.